PREVIEW MUSIC AND LISTEN NOW! Arranged and orchestrated by Richard Kingsmore, this worship song has a gospel groove to it that will energize your choir and congregation. The song alternates between soloist and choir, providing a wonderful opportunity for a soloist to shine. This alternation between choir and soloist ultimately leads to a full-choir ending that will leave worshipers breathless! A perfect choice for any Advent Sunday or as part of a larger program. With brand new lyrics from Randy Cox and Lowell Alexander, this Richard Kingsmore arrangement of the traditional Gaelic melody "Morning Has Broken" beautifully expresses the love of God shown through Jesus Christ. "Love from the Father, Infant of Mary, born in a manger, not on a throne. Life everlasting, living among us, Jesus, the promise wrapped up in love." We are honored to bring you this Grammy Award-winning song by Hillary Scott & The Scott Family to your choir and congregation. It speaks of the hope we have in every circumstance that comes from Christ alone. Written by Brenton Brown, Brian Johnson and Leeland Morring, inspired by Philippians Chapter 2, comes this huge radio song released by Big Daddy Weave. Arranged and orchestrated by Richard Kingsmore, it speaks of the power of our Savior as our victory and the reverence we can’t resist to give Him. This confident praise ballad from Chris Tomlin has a chorus full of phrases that sing of the glories of our Savior, creating a song that penetrates deeply into the worshiper's heart. The music, though contemporary, is very adaptable to traditional choral ensembles. Well arranged with piano accompaniment, or with rhythm and string parts, the music is easily learned, and will be a joy to share! Powerful! 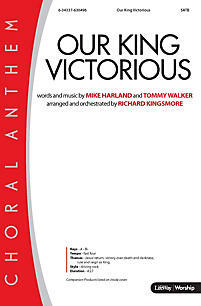 Score and Parts (rhy, dm, perc 1-2, vn 1-2, va, vc) available as a digital download. This worship ballad from Chris Tomlin tells the story of Jesus' transforming power and His great love for us. The gentle opening gradually builds to into a driving middle section, and then returns to a quiet, meditative conclusion. A true testimony in song! Featuring a soloist, Richard Kingsmore's setting of this modern song is an affirmation of praise to the Savior. There is a gentle country feel to this anthem that calls for God's spirit to draw us into a closer relationship with Christ. A good balance of unison/two-part writing and richer four-part harmonies make this worshipful ballad a satisfying selection for traditional choral ensembles, while the lyrics make it useful all year long. The power of praise is front and center in this steady ballad for the contemporary church from Matt Redman / Arr. Richard Kingsmore. The melody contains itself with a range that is very approachable, and the solid refrain offers fuller harmonies and memorable gestures. This popular song translates beautifully to a choral treatment, and the style and arrangement work well with or without the rhythm and string sections. Great for blended services! Score and parts (rhy, perc 1-2, vn 1-2, va, vc, db) available as a digital download. Richard Kingsmore has developed this triumphal anthem that serves as a statement to the covering that only comes from God above. “I find my refuge in Your wounds, for there I find salvation. We'll sing an anthem to His beautiful name, join the heavens, let the earth proclaim, bless the Lord! This driving rock anthem of Jesus' return has words and music by Mike Harland and Tommy Walker, and was arranged and orchestrated for SATB choir by Richard Kingsmore. From the very beginning you’ll be drawn into the timeless story this classic song tells! It features a male/female duet, Praise Team, Choir, and Orchestra. Instrumentation: Flute 1-2, Oboe, Clarinet 1-2, Bassoon, Trumpet 1-2-3, Horn, Trombone 1-2-3, Tuba, Percussion 1-2, Drum Set, Rhythm, Harp, Violin 1-2, Viola, Cello, String Bass, Bass Clarinet, Alto Sax, Tenor Sax/Baritone T.C., Baritone Sax, String Reduction. Octavo $2 per copy; To purchase, please contact us directly and specify how many copies you need for your choir or group. Finale Files are available for this arrangement and may be purchased separately for $24.95 once the orchestration has been purchased. To order, email us directly. This wonderful Christmas classic written by Chris Machen and arranged by Richard Kingsmore more than 20 years ago for the musical The Night the Angels Sang has been sung all over the world! With its Les Mis' feel, it tells the story of Mary, Joseph and Gabriel in such a touching way. 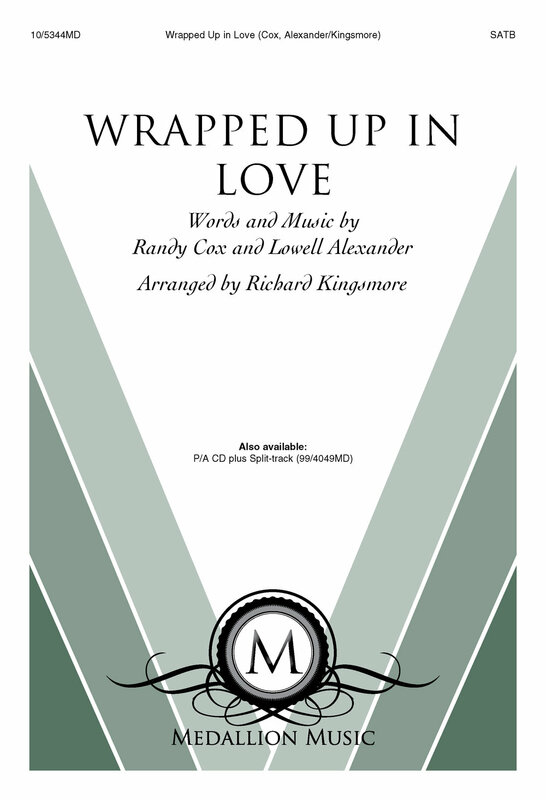 Richard Kingsmore has created a new arrangement and orchestration of this well-loved Christmas classic! It's now available with full orchestration and in sheet music with vocal lines for performance with piano! Accompaniment track, Finale files, and stems are also available with your purchase! Instrumentation: Flute 1-2, Oboe, Clarinet 1-2, Bassoon, Horn 1-2, Trombone 1-2-3, Tuba, Percussion 1-2, Harp, Synth Pad, Violin 1-2, Viola, Cello, String Bass, Rhythm, Bass Clarinet, Bari Sax, Tenor Sax, Alto Sax 1-2, Soprano Sax, String Reduction. Finale and WAV Files are available for this arrangement for $24.95 each and may be purchased separately once the arrangement has been purchased. To order, email us directly. Derric Johnson and Richard Kingsmore have teamed up to capture the wonder of the Christmas story in this captivating musical! You will love the heartfelt, well crafted vocal arrangements and colorful orchestrations with inspiring narratives intertwined throughout. Create a wonderful moment with your Adult Choir or Children's Choir this Christmas with this new setting of the familiar Christina Rossetti poem and the classic Christmas carol, Thou Didst Leave Thy Throne. You can choose to use the playable piano accompaniment provided, utilize the wonderful orchestration or sing to the stereo accompaniment tracks that are available to make your presentation even more special! Finale Files and WAV Files are available for this arrangement for $24.95 each and may be purchased separately once the orchestration has been purchased. To order, email us directly.